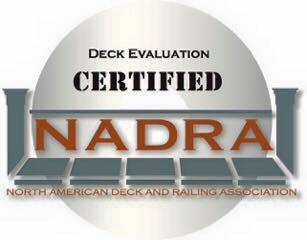 SEAL-­A-­DECK has been certified by the North American Deck and Railing Association (NADRA) to provide deck safety evaluations for our homeowners. Details on areas of your wood deck that are in critical need of maintenance, repair, or replacement, marked in red. Details on areas of your wood deck that should be monitored for future maintenance, repair, or replacement, marked in yellow. Our expert recommendations for how best to move forward with any needed safety upgrades, marked in green. Not sure whether your wood deck is in good condition and meets current safety standards? Our 100-­point evaluation service starts at $199. Responsiveness, attention to detail and customer service were all excellent.